WordPress 3.7 “Basie” is out! So, where should we start after upgrading? There are so many things going on with the new WordPress version that it is hard to go through everything in a post. For sure, this version is a quantum leap into the vision of making WordPress upgrades as silent as Chrome browser does. It also introduces a better meter when choosing passwords, which is awesome. And I’m not forgetting the new language packs, integrated with WordPress.org, for a seamless experience on distributing the right translations to the users. But for us, wannabe-developers, there are so many tiny changes under the hood that it will take time to notice all of them. One of the small changes I am interested about is the new improved search mechanism. It was a well known issue on the community: WordPress search mechanism was poor and was only returning results ordered by date. WordPress 3.7 introduces the concept of stop words in the core, thus improving the search results quality, and it will order them by relevance, giving special attention to the search terms found in the title. It is a small change but important for those of you who don’t want to install plugins to improve the search functionality. For those who still need more than what core offers: try geeSearch Plus! I’ll cover the search changes in deep on a future post about the new version of geeSearch Plus. I’ve been working on a plugin which requires some changes on the Insert/edit Link dialog box at posts editor. 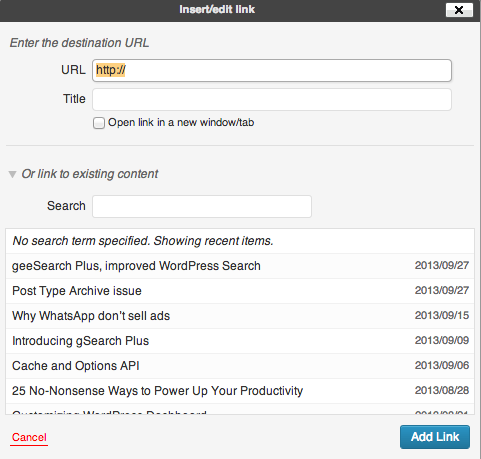 WordPress 3.7 introduces two brand new filters to allow some query manipulation on the internal links (shown when toggling Or link to existing content link). As per the wp_link_query, it allows you to filter the query results before they are sent to the screen. The results array only contains the post ‘ID’, ‘title’, ‘permalink’ and an ‘info’ label, which by default shows the post date (for Posts) or the post type name for custom post types. This is just a tiny fragment of all the unleashed potential of WordPress 3.7 version. Be sure to check out the release notes full article.